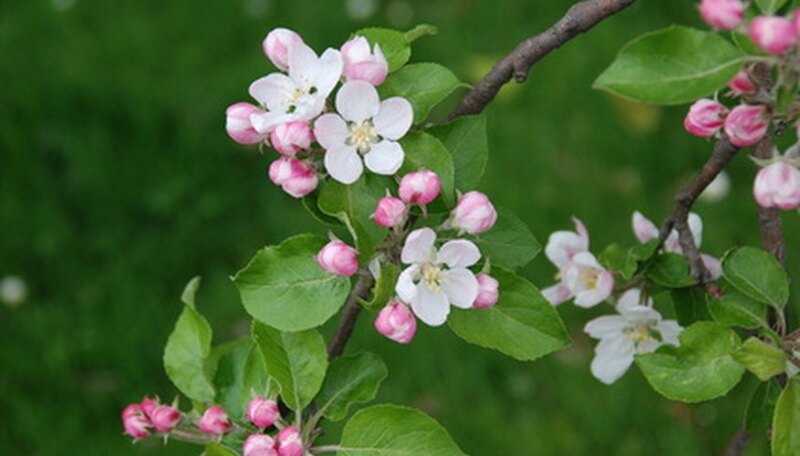 Flowering crabapple is rarely grown for its sour fruit. Instead it is prized for its spring flower display in shades ranging from white and pink to a vibrant red. Deep green foliage in summer fades to a striking autumn display, then the bright red fruits stay on the tree and attract wildlife throughout winter. Crabapples are truly a four-season ornamental. While crabapple trees thrive throughout the country, they are prone to several diseases and pests. Recognizing problems early allows you to take the proper steps to cure them, keeping your tree healthy and attractive. Crabapples are not bothered by most insects, though tent caterpillar and webworm nests may damage the tree or become unsightly. Prune out affected branches if these insects nest in your tree, removing both the insect and its nest. Japanese beetles may also infest crabapples but are usually only a concern on young trees. Treat these infestations with the proper pesticide if necessary. Apple scab is a fungus that leads to massive leaf loss and may eventually cause death. Not all crabapple varieties are susceptible, so while this disease can be treated with fungicides, it is often better to plant resistant varieties. Apple scab affects leaves in spring if there is a lot of moisture in the air. It causes dark spots on the leaves and misshapen fruits. As the disease progresses, leaves begin turning black and drop from the tree. If your crabapple has dark brown or purple wounds on the branches or trunk and is producing an orange sap, it is likely infected with the fireblight bacteria. One of the first signs of a fireblight infection is that new shoots begin withering and dying as soon as the tree begins growing again in spring. Prevent the spread of fireblight in infected trees by pruning out infected branches immediately. There are also many varieties of crabapple trees that are resistant to the disease. Crabapples require only minimal irrigation once they are established. Frequent watering is only needed in the first year after planting. If you have a particularly dry and hot summer or live in an area that is prone to drought, some additional irrigation is required; otherwise flowering and fruiting the next year is affected. Prevent this by watering the trees during hot, dry periods once every one to two weeks. Crabapples require about 2 to 6 inches of water when you irrigate.